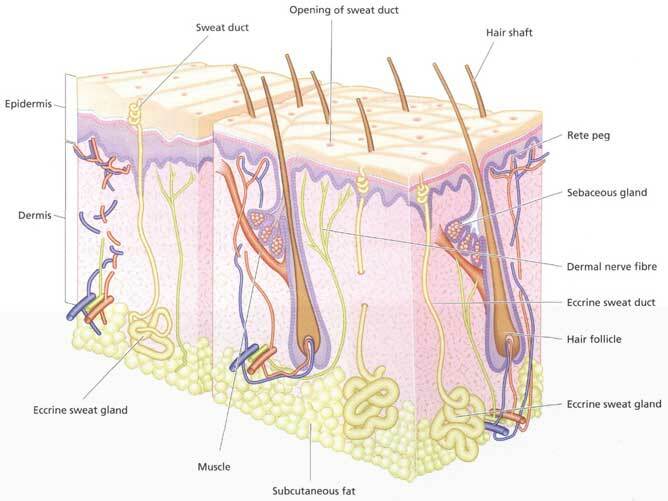 your skin protects you against foreign objects or substances entering your body. collagen and elastin fibers provide skin with strength and resilience, making your skin a formidable barrier against outside attack and assault. micro-organisms, present on the skin, help combat attacks from harmful bacterial and viruses. your skin's acid mantel's pH helps control and regulate fungal and mold (mould) growth (preventing uncontrolled growth). helps regulate body temperature, through the regulation of blood flow (in the dermis) and the production of sweat - to cool the body. helps control the rate of water loss from the body - oil (sebaceous) glands produce sebum (an oily substance) which coats the skin, waterproofing it. Melanocytes in the Epidermis produce melanin, which functions as a UV filter, protecting your skin against harmful UV radiation. numerous nerve ending in the dermis allow the body to sense hot, cold, pressure and pain. Providing the body with vital information about the outside environment. produced in the skin in response to sunlight. Vitamin D is important in the body's calcium metabolism. The skin is misunderstood, neglected and taken for granted, as its performs its functions automatically and mostly without conscious effort or thought - that is until things go wrong. To help your skin be the best it can be by using proper well formulated skin care products and regimens is a smart dividend paying investment. For more information see Nancy K Brown Skin Care Products and Regimens.